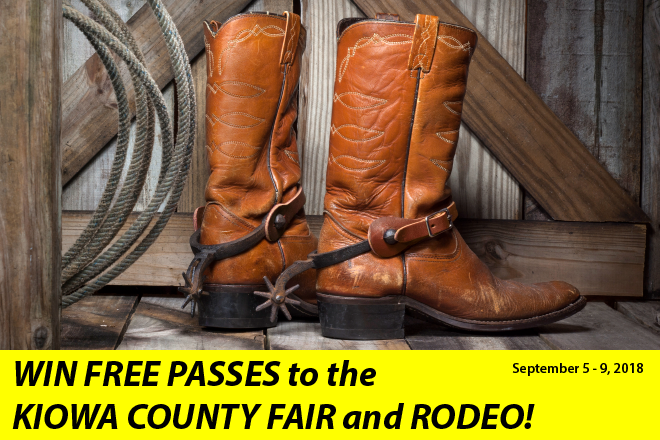 KiowaCountyPress.net and Plains Network Services, Inc. are teaming up to sponsor a drawing for free passes to the 2018 Kiowa County Fair and Rodeo, set for September 5-9. Simply stop by the office at 1208 Maine Street in Eads between 8:00 a.m. and 4:30 p.m. Monday through Friday to enter the drawing. No purchase is necessary, and you do not need to be present to win. You'll often find us in the office Saturday and Sunday morning, so feel free to stop by then as well. There is a limit of one entry per person or household per day. You must be 18 or older to enter. The drawing will be held Friday, August 31, 2018, after entries close at 5:00 p.m. The grand prize is a set of two wristbands good for entry to the fairgrounds Friday and Saturday, where you be able to enjoy the rodeo, horse racing, exhibits and much more. Second prize is a set of wristbands valid for one day entry to the fairgrounds and all the activities. For more information on the fun and excitement, see the 2018 flyer linked below.